Ned and I first met in 1975 when he and I started work in the ITMC at Paddington. Ned had joined OTC from Brisbane where he underwent formal training at a Technical College after which he underwent field training at a variety of OTC locations. Ned was a bit of larrakin but was well liked by all with whom he worked. He quickly made friends when he relocated to Sydney and shared a house at Bondi with a group of OTC technicians-in-training with whom he became life long friends. Ned was intelligent and a hard worker and soon became a subject matter expert on a number of technologies. Ned also looked after his fellow technicians which led him to become an employee representative on the PREI (Professional Radio Engineers Institute (Australia)). He also became knowledgeable of matters relating to superannuation especially after the merger between Telecom and OTC was announced in 1990.His knowledge and expertise were in demand and people sought him out both when he worked for OTC and after he joined Optus. Ned achieved the level of Senior Technical Officer (Grade 1) in OTC before resigning to become a founding member of the Optus Network Operations Centre in 1992.Ned went on to work in the International Division of Optus where his knowledge and expertise in the dimensioning and routing of telephone traffic across the international telecommunications links was invaluable and enabled Optus to optimize it profits through traffic profiling and establishing extremely good relations with its overseas partners and especially with Singapore Telecom who became his ultimate master before he chose to leave Optus a few years ago. Ned will be sadly missed by his many friends and his family. Ned and I first met at OTC Paddo when I was a trainee tech in the MRSC and Ned was in the ITMC. We got to know each other whilst on the Governing Council of our union, the PREI. We did a fair bit of socialising back then, but lost contact when I went to Malaysia to help set up Time Telekom. Ned was a great guy and a great mate. I wish Carmen and her family all the very best for the future. Having lost my first wife prematurely, I know what she is going thorough. So sorry to hear of Col’s passing. Please include my condolences if you are speaking with Carmen. What a great loss! I am sure you were upset as I was, my sympathy to you as Ned was a true friend to us. Please pass on my sympathy and condolences to Carmen and Ned’s extended family and close friends. Advice on the funeral would be appreciated. 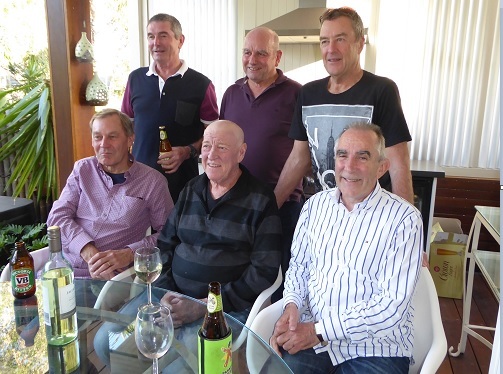 I first met Ned in early 1974 when we were transferred to Sydney from Perth and Brisbane respectively and were accommodated at the Eversham Guest House in Manly along with many other interstate trainees of our year. Ned, always the organiser, had come up with the idea of renting a house in Bondi as it was close to Paddington where several of the group were working and it was on the beach which was desirable. I was initially unsure about committing and being part of the Bondi household as I was enjoying Manly, I was working in head office Martin Place, the Manly ferry was a pleasant trip to work and I didn’t know Ned from a bar of soap but was talked around over a beer in the Manly Hotel. What followed was a great friendship which lasted a lifetime and included our partners Jo and Carmen, many other friends and work colleagues. Too many to list. Ned was an affable larrikin with a big heart and the best mate a person could have. After sharing several houses with Ned I left Sydney and returned to Perth but we always stayed in touch. Once our families grew up we started having regular reunions with partners and friends from that era and it was always a matter of just continuing on where we’d left off the last time we met. I always thought Ned was bullet proof and it was hard seeing him so unwell and deteriorating the past 7 to 8 months. Jo and I did spend some quality time with him and Carmen this year and despite his illness he was always the same old Ned. Carmen has been inspirational in the way she’s looked after Ned and ensured his last days were as good as they could possibly be. Ned was a good family man and his daughters Ashley and Stephanie are a credit to him and Carmen. Ned was never one to let grass grow under his feet and led a fulfilling life. RIP mate, I’ll miss you heaps. 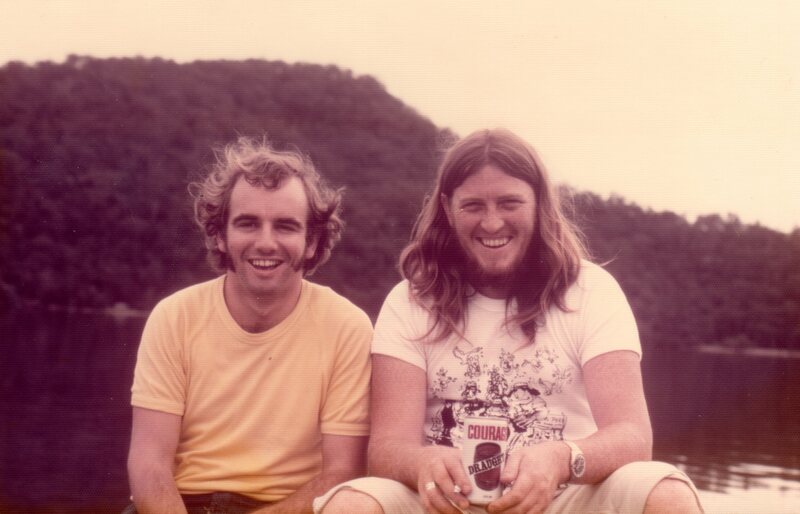 The attached photo is of Ned & I was taken on the Hawkesbury River around 1974/5. The attached photo supplied by Kevan Bourke was taken in August when Ned’s friends got together to support Ned. The people are Mark Roberts, Kevan Bourke, Bruce Mayberry rear, Ray Pow, Colin Kelly, Steve Marshall front. I can’t make it on 13th but could you pass on my condolences and best regards to all. Ned was a great guy I did not know him well but really liked him. I heard the tragic news about Coco. I had seen him a few weeks earlier with Carmen. He was in fine form. So sad to leave us way too early, but one never knows the time. It is very hard to express the enormity of the loss for all of us. Col was one of a kind, the most unique of people. He will be greatly missed. We are all better people for having shared our lives with Col.